29 of the ULRA throughout the Spanishspeaking world to the exclusion of much else. Her working through the night was common, as was working every day straight. Luz was tireless in this labor for 29 and a half years, with her last time at the computer just a few days before God called her home. It was truly a labor of love for Our Lord and His Most Blessed Mother, for the ULRA and especially for the Spanish-speaking members. She prayed for humility and made every effort to be invisible. She was working for Our Lady and would remain completely in the background. Luz was small in stature but mighty in virtue, with the singular purpose of getting to Heaven and taking as many souls with her as she possibly could! We know, without any doubt, that Luz still holds us all close to her heart and she will never cease to lead us into the arms of our Dulce Madre! Early on, Luz helped us in making the St. Philomena cords by running a drill bit, twisting the red and white cords upon themselves. And she sat for hours making Agnus Dei badges. She treated them like gold, parsing the precious wax into the smaller, individual, laminated Agnus Dei badges. She gave each one the care and attention to detail worthy of such a treasure, marveling at the blessings given to us by Holy Mother Church. Luz had translated articles, booklets, leaflets, newsletters, prayer cards, Fr. Ivan’s letters, the yearly Calendars, price lists and instructions for the representatives. After she was diagnosed with pancreatic cancer, some days she was too weak to help with translations. She offered up that disappointment as she did her entire illness with complete acceptance of God’s Will and total trust in Divine Providence. Through the years, she was tireless and indefatigable. 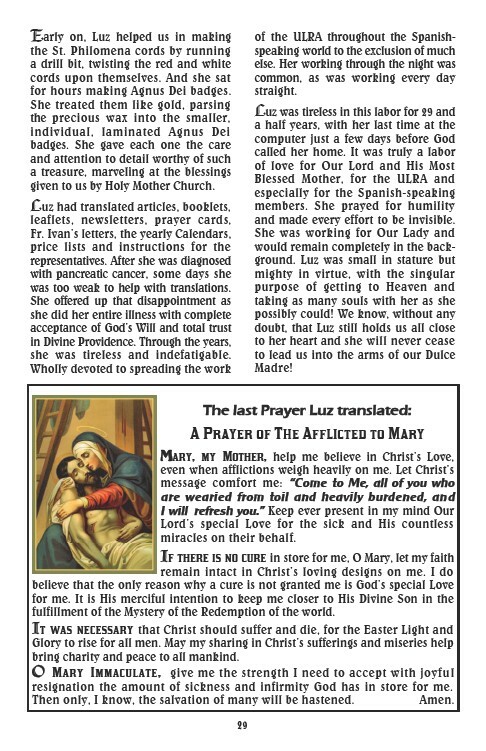 Wholly devoted to spreading the work The last Prayer Luz translated: A Prayer of The Afflicted to Mary Mary, my Mother, help me believe in Christ’s Love, even when afflictions weigh heavily on me. Let Christ’s message comfort me: “Come to Me, all of you who are wearied from toil and heavily burdened, and I will refresh you.” Keep ever present in my mind Our Lord’s special Love for the sick and His countless m iracles on their behalf. If there is no cure in store for me, O Mary, let my faith remain intact in Christ’s loving designs on me. I do believe that the only reason why a cure is not granted me is God’s special Love for me. It is His merciful intention to keep me closer to His Divine Son in the fulf illment of the Mystery of the Redemption of the world. It was necessary that Christ should suffer and die, for the Easter Light and Glory to rise for all men. May my sharing in Christ’s sufferings and miseries help brin g charity and peace to all mankind. O Mary Immaculate, give me the strength I need to accept with joyful resignation the amount of sickness and infirmity God has in store for me. Then only, I know, the salvation of many will be hastened. Amen.